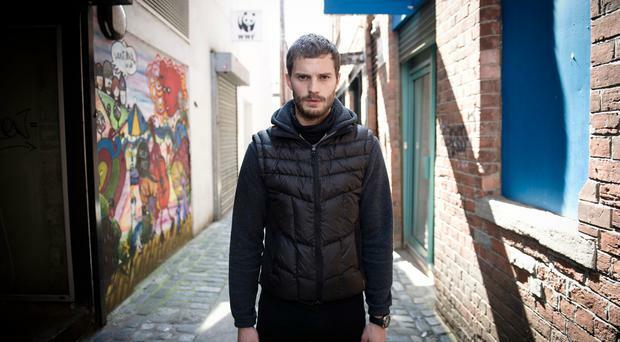 Jamie Dornan has said he gets recognised in Belfast more than anywhere else and avoids certain areas of the city because his drunken fans can be "a bit hands-on". Dornan (36) stars alongside Matthew Rhys and Ann Skelly in Death And Nightingales, the BBC's adaptation of Eugene McCabe's modern Irish classic novel. The actor, who was born in Holywood, Co Down, said admirers in Belfast had "lovingly" attacked him. Some had even placed him in headlocks when he was out with friends. He told the Radio Times: "You know, Belfast is brilliant now. It's got amazing places to eat, the bars have always been brilliant, the people have always been brilliant. "There are a few places I would avoid a little bit now because I'm probably more recognised at home than anywhere else in the world and sometimes it's, er ... people with a few drinks in them can be ... well, they're a bit hands-on. "You're in a headlock before you know it. "I mean it's the most loving headlock you can imagine, but sometimes you're not up for that when all you want is a quiet drink with your mates." Dornan starred in the Fifty Shades franchise as Christian Grey and won plaudits for his portrayal of a serial killer in the BBC's psychological thriller The Fall. He said returning home to film Death And Nightingales had been "nostalgic" and "emotional" but he felt now that his life was in the Cotswolds, where he lives with his wife, actress Amelia Warner, and their two daughters. He said: "A lot of the most important people in the world to me are there - my dad's still there, my best man, one of my sisters and her family live just down the road from my dad... I found it very nostalgic and quite emotional at times to be back there." He added: "I like to tell the kids that they're Irish a lot and keep hoping that they'll say the odd word in my accent, but they haven't yet."